To say things have been crazy since I came back from the Bead and Button Show is to put it mildly. 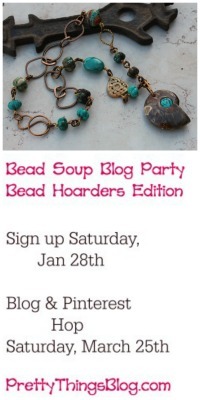 The sign ups for the Bead Soup Blog Party started the next weekend, Zack went to camp, I tried to clear my table (unsuccessfully) and before I knew it, I realized I hadn't posted my giveaway! This is a five-part giveway -- which means there are five chances to win something. In full disclosure of what was bought and what was donated: The mini Wubbers were in my treat bag; the winged heart was donated by Andrew of Green Girl Studios, the olive, pink, and brown ceramic pendant was donated by Golem Studio, and the dotted ceramic pendant was in my swap bag from Suburban Girl Studios and she said I should pass it to you. 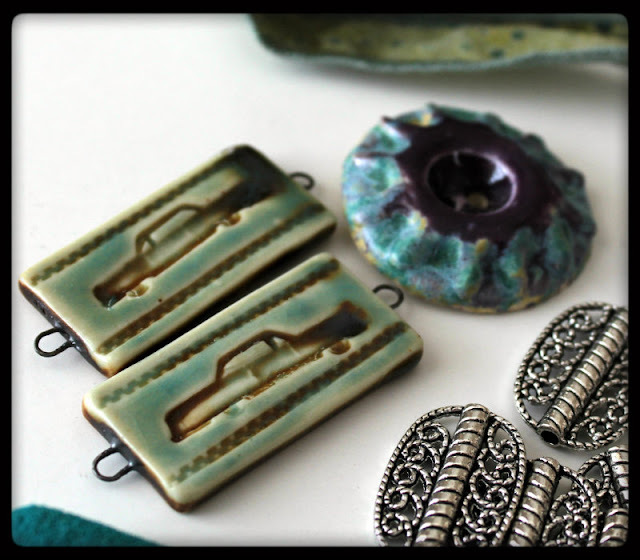 The filigree pewter, the purple mother of pearl pendant, the blue Greek ceramic pendant, the awesome-cool ribbon, the handmade ceramic button by Diane Hawkey, and the car-motif connectors by Earthenwood Studio are from me. Wouldn't those car connectors be AWESOME for a story necklace about your summer vacation? Giveaway #2 is a FREE Bead Soup Book. You'll receive it as soon as it's published. The third giveaway is my eBook on blogging inspriations. an "I'm a Bead Souper!" tote bag! In your comments, please let me know what you've done. And I shared it on my Facebook page, too! Will blog later today on this and will post on FB. My fav would be the Mystery soup mix!! I will blog about you giveaway after I leave this comment. I would love the soup giveaway. Your soups look so yummy! I will also place it in my wall. <3 you!! Girl you are one generous person!!! All these awesome gifts!!!! Oh, I would LOVE to win all this for my sister! WOW! What nice things you are giving away. I like the first the best. I blogged about it, and posted it on facebook, and am about to tweet about it. I have already shared on FB, I will be doing a blog post shortly, the one I would most like has the car connectors, so I can create something and donate to an autoracing fundraiser. This is very generous and really cool. Thank you for chances to win! If I should win...and I think I might, because 7/13 is my MOVING DAY, and I'm so excited!...I'd love to receive the "bits and bobs" selection from Bead & Button. Can't say why, exactly, except that it will make me feel almost like I was there with you. Thanks as always for being such a generous, giving lady! This is amazing. All of the prizes are so generous. If I won, I would love prize #1 because I adore all of the art beads and need some more pliers. Or #5, the soup by you, because you have a wonderful way with colors. I've blogged, and will facebook, too. I just blogged about it. What great giveaways, Lori! Thank you for your generosity! My favorite is the Bead Soup book. Second choice would be a super soup hand mixed by you. Lori, I love all the items but the Bead & Button assortment is my fav. I just blogged about it on my blog. Have a beadiful day! Awesome, Lori! I'd love to win the eBook. Oops i forgot...my favorite giveaway is the goodies from bead and button!!! 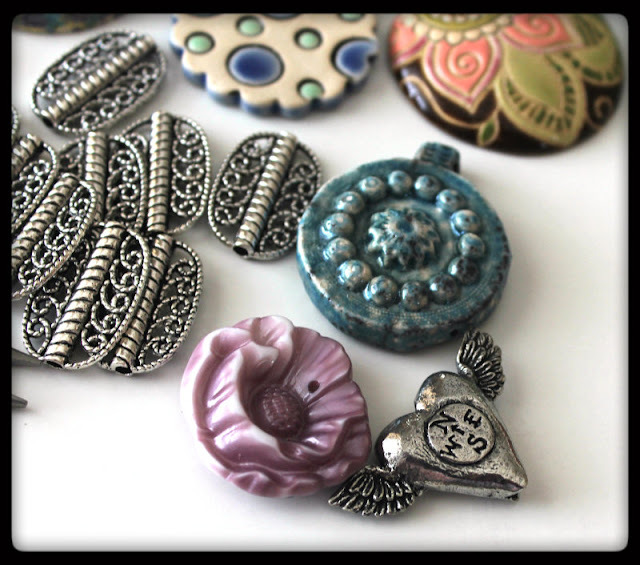 I am partial to that delicious bead and button goodie mix up there, as well as the mystery bead soup ! Who doesn't love a good surprise, after all ! AMAZING Lori! And guys, I have the ebook and it is filled with so many amazing pictures and ides! Will do a blog entry later tonight when it is cool enough to sit upstairs with my computer & my beads. I'm in! I've posted a blog about it. I have already purchased a copy of the Bead Soup book, or that would be my favorite. I can't wait until it comes out. I'll share on FB as well. Dear lori, I blogged about this on my blog at Rising Designs.blogspot.com. thank you, your a sweetie! Oh dear Lori, how can I pick a favorite? Well, If I must-it's the give-away #1 that makes my mouth water!!! Sharing on FACEBOOK page @Rising Designs. Thanks so much for this chance! -commented (hee)....I'd LOVE the Bead Soup book when it's published! Have an excellent weekend, Lori! I'm in...my 1st choice is the Book my 2nd is the e-book, 3rd beads, 4the tote. I blogged..shared on google, facebook,twitter. Love the beads, especially those ceramic car connectors. But I would love to win your Bead Soup book too! Which to choose, which to choose!?! Thanx Lori for the great giveaway. It is very hard to choose which prize I like the best but I will take my chances on the mystery soup. It's so fun getting a mystery package (kind of like Christmas)that I couldn't resist. I posted on my blog & tweeted about it. 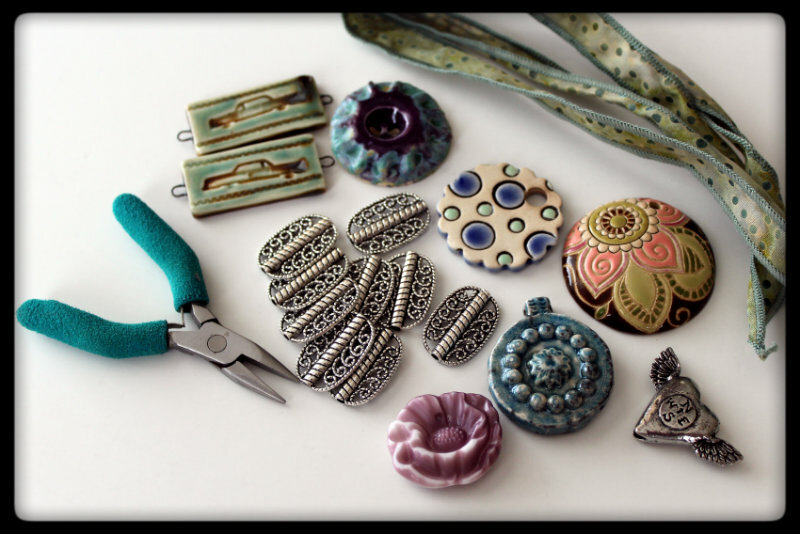 I would love to win the goodies that you got at the Bead and Button show. What a great great give away I would feel honored to win anything but i am not a lucky person lol but anyone of your give aways are fantastic but i love mystery i say your myster give away would be my favorite. It's nice that you actually BUY some of the things you give away instead of asking for handouts. It's not unnoticed. Don't count me in the giveaway, I'm not posting my name because I'll get massacred, I'm sure! But thanks for all you. Bead giveaway 1 is awesome! I adore the colors and patterns. Those are some of my favorite companies too!! Lori, this is awesome. I blogged, & facebook. 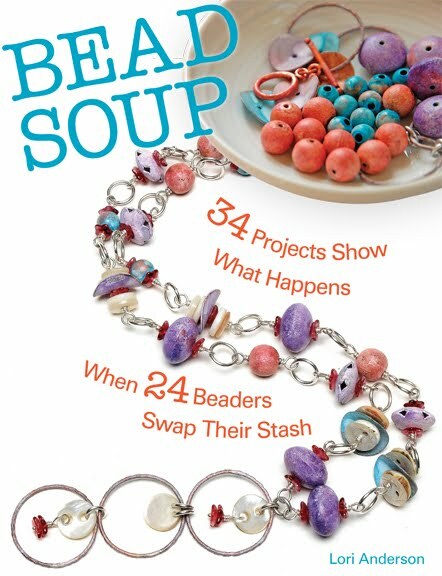 hard to choose which I would like, but I think I would love to have the Bead Soup Book. But, of course any would be an awesome prize. Thank you. I blogged about All your cool stores on the 5th!!! :) I shared Cafe Press, your store with Soup mixes & clasp mixes, and info on pre-ordering your book!! I'll be sure to post the give-a-way on my Toltec Jewels FB page, my Jewel School Friends FB page, and update my July 5th blog post to include winning the cool items I said one could buy. If I were to win, I'd love to win the tote. Love the giveaway. My favorite would be the new Bead Soup Book. Lori, this is so great. I feel like I need to give back to the community real soon. Which do I love the most? That's a toughy, but I think I'd better go for the book. Really curious how this evolved into a commercially published book! I have blogged and Facebooked. sharing this on my blog and my facebook page! would love to win any of them but number 1 & 2 are my favs! thank you for info, giveaway,& giving me another spot to be a part of & share. posting here/blog/FB/Twitter. Artists,crafters,new hobbyists need places to commune with like minded people & find new inspirations~! Thank you for the site/blog/info/giveaways. I know artists/crafters/new hobbyists need places to come to chat with like minded people, help with issues/problems & find new inspirations. We need to stick together ~! good luck to all~! Definitely a delightful giveaway - whatever the prize! I would like to win any of them of course but any of the beads would be my choice if I had to choose since I rarely get to buy them on my own. But anything would be great!!! I dont have Twitter though. The 5 gifts are all wonderful - what I find myself liking is the Tote and in pink no less. They are all wonderful, would love to have any of them. Will post this on FB also, thank you! You are so generous! I am a book junkie, so I would love a copy of the book...but I'd be happy with any of the wonderful items you are giving away! I have a blog post scheduled to go up tomorrow night at 7:45 PST...while I will be lounging in Las Vegas! I love technology! Oooooh, I would love some beads, or some mystery beads. Thanks Lori for all you do in the beading community. I blogged and facebooked it. I would have tweeted, but I don't do that yet, lol. Going off to post this news of your continued awesomeness and generosity on my blog. And then I'll be dreaming about how cool it would be to have that fabulous B&B souvenir pack or the soup you're putting together! I am most excited about your book! I would love to try, I'm in! If I have to choose one favorite it would be the new BSBP book. I would be pleased to win any of your lovely offerings but I think the B&B items are cool. BTW~ here's my blog post about today's giveaway. Boy Lori - you just never stop giving :-). Thanks for another opportunity to receive. I blogged about this giveaway - love the idea. I also did a facebook comment/link. Thanks for the opportunity to win the beads (my favorite) or whatever you choose to give away. Hi Lori - (2nd time posting) I don't know if my first one worked. I also facebooked this announcement. Thanks for your generosity. I'm happy with anything - your surprise soup intrigues me. And I tweeted and liked on FB. I posted on my FB page as well as have my blog however, I only only have two people following my blog so far :-( so more people will the post I did on my FB page. Lori, I love your give aways and one day I am determined to win one! i would love a bead mix picked out by you! i am posting this on my fb page also. thanks for doing this. Joining in! I have tweeted, posted to my blog and liked and posting it to BF too. What awonderful giveaway! 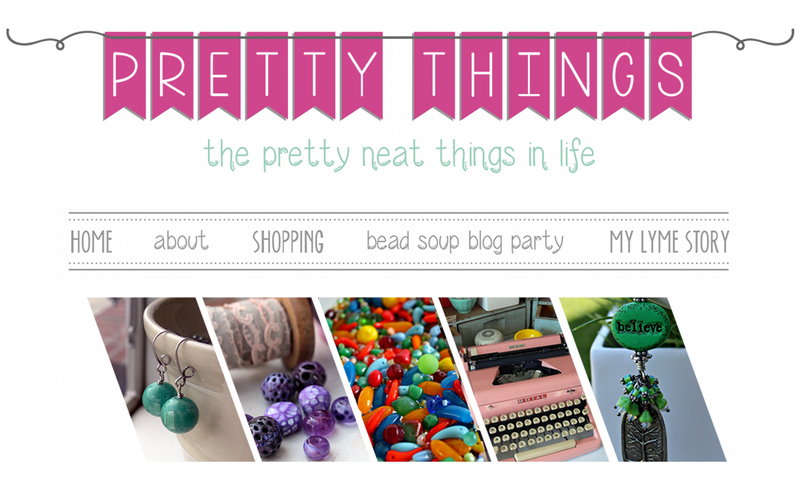 I would love to have the blogging inspirations( as my first choice) or #5- your mystery bead mix! Hi Lori, I posted about the giveaway on my blog, FB, and Twitter. I love all of what you are giving away, but if I had to pick, it would be the tote or the beads. You are so generous! Awesome giveaway! I blogged and facebooked about this super give away ! Okay, if I have to choose just one prize, Lori, it would have to be the Bead Soup Book! But all those cool beads and connectors and ribbon are amazing, too! I am overwhelmed by this give away. Thanks so much for offering us all a chance to win. It really hard to decide but lately I have been all about ribbons and art beads so I would have to say #1 with the rest being a really close second. I'd adore receiving some of your mystery mix, Lori! I'll do a writeup about the giveaway fro my blog. Thanks so much! I would so love to receive some mystery bead soup!! The Mystery giveaway is my favorite!!! Thanks for doing this, Lori! Lori, you don't make it easy... Every single giveaway in this mega giveaway are tremendous offers. Bead Soups, I have recently discovered, and think they will be a habit I can't give up. Books are always wonderful reference and inspiration points and who can't use a decent tote??? I had to share the news and posted everywhere - both of my fb pages, my blog and G-1. Gotta share the wealth and have to lead people to great information. Hi Lori, just stopping in to say I posted on my blog, on my Facebook page and also made a tweet on twitter! Thanks for making these giveaways possible. Free Stuff! yes! I love the Bead & Button loot, the handy tote, your book,... oh wait - I was supposed to pick one favorite? Can't do it, but your on my Blog as well! What a batch of fabulous giveaways. I'd be totally beside myself to win any one them. I'd be pleased as punch to win any of these great things Lori. You sure organize the greatest parties and giveaways. This will be my first go at this so hope i get it all right. Would love to win a mix of beads or the fabulous book. That's such great giveaway Lori! I've posted about it on my blog,Facebook and Twitter too! and the bead soup is my favorite! I'll also share it on FB. Wow, Lori! It would be great to win any go these! What a generous giveaway! I would love Giveaway #2 (Bead Soup Book)or for a MYSTERY SOUP. I had posted on my blog http://www.blog.ahowinjewelry.com I will share on facebook later. Will be blogging about this later. I'd love to have the ebook. I need blogging inspiration! Hey Lori, I am having such a had time containing all of my excitement over the bead swap and now your awesome GIVEAWAY!!! So her is my comment, I have posted on my blog & FB and tweeted about it too. I hope to be one of the winners and I would love it to be giveaway #1. You are such an amazing woman! How do you manage it all!? The Bead Soup alone is staggering. 400 participants?! I LOVE give away #1.. only because the beads/bits/pieces and the Wubbers-I do need a new pair- but, the book looks fantastic, and who wouldn't want a handpicked mix bag from you?! 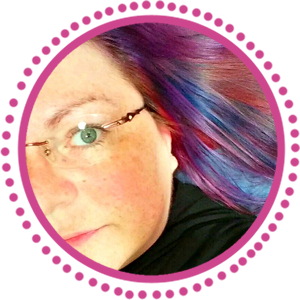 I am going to blog (http://www.thecrafthopper.com) about it right now, and post it to facebook, as well as twitter @MamasCraftRoom !! Hi Lori, Thank you for the generous give away. My favorite thing you are offering is the hand mixed bead soup though I admit I am also partial to the pretties you picked up at Bead and Button and your book looks fabulous. I can't wait for it to hit the shelves. Best of luck with it! I sent out a Tweet and posted on facebook about your giveaway. Cool stuff! Also - blogged about the giveaway today! Thanks again for hosting such a generous giveaway! I love those beads so much Lori, but seriously, it's all cool! I already have your blogging e-book (love it! ), but if I was lucky enough to win, I'd love to win the beads or the book or the other beads! And I've just blogged about the giveaway on my blog! Just blogged about your giveaway. Can't figure out how to make the title a link for the post, but it's here. Just tweeted (actually twice by accident) about your blog and giveaway. Just posted to my facebook page about your blog and giveaway. The blog post about your giveaway is slated to post on Wednesday on my blog http://clay-space.com. You are also in my buffer for a FB mention. Thanks for all of the wonderful things you are giving away! My fav? The beads (it's a great chance to receive beads that I could not find in Italy!!!! ), the pink bag is just fantastic...and let's talk about your books...Ok I like all! Giveaway #1 and #2 are my favourites. Crossing my fingers, hoping I win one of them! I'd love to win the Bead and Button Show goodies since I didn't get to go myself:) I blogged about your giveaway at www.KnotJustMacrame.com, shared on FB & tweeted (can you tell I'd really love to win!!) Thanks for the opportunity! http://beadloverskorner.blogspot.com/2012/07/lori-andersons-five-bead-and-button.html (which will also go on Facebook and Twitter) and I would love the MYSTERY SOUP! I blogged and FB'd about it! What a fun giveaway! I would choose 5, 1, 2 all creative fun!!!! thank you Lori! my favourite is the first, bead and button goodies. p.s. I' m in time with Bead Soup, I just finished the first piece! Woo-hoo!! What a great chance to win things I would actually use. My wish to the Bead Fairy is for the tote or for give-away #1. And, I am sharing this on my FB page. Thanks so much for your generosity! What a generous giveaway! I blogged about it and posted it on FB. I would love to have any of the prizes but my favorite would be the first one. I love the ceramic pendants.....they are so unique! Thank you Lori!! I want #1 because of the Wubbers but I really really would love to have the book. Either one would be a great gift. What an awesome and generous giveaway Lori! Your heart really has no boundaries. I honestly am having a hard time selecting my favorite of them, I love each one equally! Can I say that my favorite is all of them? I would be happy with any! I will be writing a blog post on Wednesday July 11th and posting it on my Facebook page now. Lori - I would love to have #1 because of the Wubbers but I would also love a copy of your book. I will keep my fingers crossed. Friday the 13ths are always lucky! Lovely stuff, I love number 1 but they are all amazing prizes!! Lori - you are so incredibly generous! All of your offerings sound so great, I'd be delighted if I won any of them. I've been meaning to pick up a copy of your blogging book. Think I'll hold off until Friday, just in case. :) But either way, by next week I will own a copy of your book. I don't know what happen to my comment, but I went to add something to it and I think I deleted it. Oops. I'll enter again, just in case. ooh, a mystery bead soup! makes me drool! haha :D that's what i'd be after! My post about your giveawy is also on my facebook and twitter. Thanks! Oh wow! What a great give away! I would probably chose the bits and bobs, or the surprise soup from you. We all know you have good taste, so that's it, I've decided it will be the surprise soup!! Off to blog about it now! 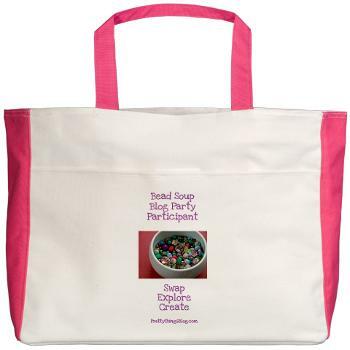 Wow, such great prizes, but the beads or mystery soup are my favorites:-) I blogged, highlighting your Bead Soup book!!! and posted on facebook. Wow! 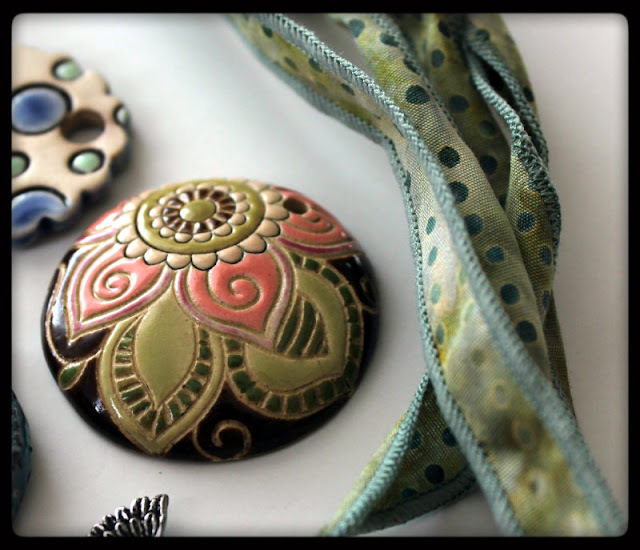 Count me in, I would love to win the goodies from the Bead and Button show. Unfortunately, I was not able to join in this bead soup party, but will look forward to the next one. Thanks for your giveaway Lori. Stay cool in this heat! Anyone of them would make me happy. Dang! Forgot to say, I don't blog - so this was posted on my FB wall. Oh Boy Oh Boy Oh Boy. Ok so I am loving the first giveaway with the assortment of beads b/c I've been dying for a golem AND a green girls studio pendant for awhile now....OR a mystery soup would be awesome too! I'm blogging about this here: http://beadful-things.blogspot.com/2012/07/fabulous-giveaway.html and I am also posting to facebook about it because it will probably reach many more people there than it will via my blog, unfortunately. (New followers welcome!! ) : ) Great giveaway Lori!! Thanks for the opportunity to win. FUN! I'd love to win the olive, pink, and brown ceramic pendant. It would be a challenge for me! And the pretty purple MOP pendant is pretty too. Or your book. :) Thanks Lori... your blog is always so inspiring and fun! I'll go blog about this on my blog now. my first time here, i followed the trail of beads, yes i am a bead stasher, i always need one more to make the necklace......grins, you have such an assortment of things going on, can i like them all??!!! My favorite would be any of them. But the order I would choose would be the bits and bobs, book, mystery soup, tote bag (mocha), then eBook! First time here!! LOVe all of it. I have just started making jewellery so i don't have very much stuff so I would have to say the beads are my favorite. I have shared this on facebook and pinterest. THANKS! Thank you Lori for being such a generous lady!! Hi Lori, I just wrote about your giveaway on my blog. Baublicious.blogspot.com. Hope you like! As for my favorites of the giveaways they would have to be your ebook, your Bead Soup book and your mystery soup (because Who doesn't love a surprise) in that order. Oh Lori, you are too good to us! I would love to win any of the lovely things you are offering! I will post this on my blog and on my FB page! I'd enjoy any of the giveaway items, but the Book is what I'd like most. Although I'd be happy to win anything on that lovely list! Oooooh! So many goodies! I'd like to win them all, but my favorite has to be the beads and your book on blogging! Now how in the world am I suppose to pick just one favorite? If I had too, I think I'd pick #5...I love a good Bead Soup!! Hey Lori - awesome giveaways - will be posting on my blog and facebook page. I love giveaway 5 - life is a mystery! OOOOH! I want to win something! Pretty, please? They are all so wonderful- I have a hard time choosing, but I think what I'd like the most is your e-book on blogging inspirations. That would really come in handy. Wonderful giveaway!! I would love the bits & bobs~~~giveaway #1. Great giveaway! As for my favourite it's a really tricky question. But I love books and surpises so if I had to choose it'd either be #2 or #5. I've just blogged about the giveaway. Thanks for the chance to win one of these lovely prizes! OH MY GOODNESS... this is amazing!! And for me, I don't think I can choose which is my favorite part of the give-a-way....I guess the bead soup....but only 'just barely' above the other prizes!! i can't believe i almost missed it! Well, you just count me in and hopefully I will be a lucky lady on Friday. I hope yo are keeping well. Thanks for the fun Lori. You are such a generous hostess Lori! All of the items are lovely but if I had to choose just one, I'd choose your new book (an autographed copy of course!)! Love those car connectors! Also that beautiful winged heart. Thanks for the giveaway! Wow...such an awesome giveaway! I am facebooking this and spreading the word. All a great prizes! Thanks for the great giveaway. I couldn't see if this is open to international people, but if I win I'd be happy to help with postage. I have blogged about it (and done facebook and twitter). In order of preference, I'd like the bead soup book or either of the bead mixes.